The Ebola virus causes an acute, serious illness which is often fatal if untreated. 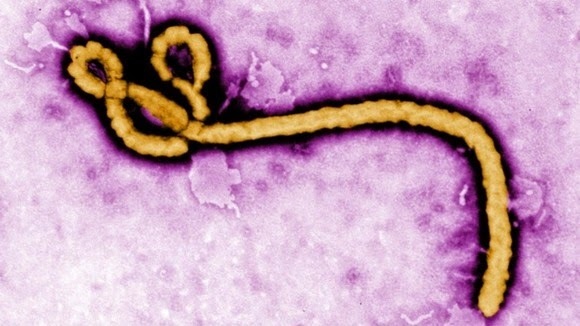 Ebola virus disease (EVD) first appeared in 1976 in 2 simultaneous outbreaks –Sudan and Democratic Republic of Congo. The latter occurred in a village near the Ebola River, from which the disease takes its name. The current outbreak in west Africa, (first cases notified in March 2014), is the largest and most complex Ebola outbreak since the Ebola virus was first discovered in 1976. EBOV carries a negative-sense RNA genome in virions that are cylindrical/tubular, and contain viral envelope, matrix, and nucleocapsid components. The overall cylinders are generally approx. 80 nm in diameter, and having a virally encoded glycoprotein (GP) projecting as 7-10 nm long spikes from its lipid bilayer surface. The cylinders are of variable length, typically 800 nm, but sometimes up to 1000 nm long. The outer viral envelope of the virion is derived by budding from domains of host cell membrane into which the GP spikes have been inserted during their biosynthesis. Each virion contains one molecule of linear, single-stranded, negative-sense RNA, 18,959 to 18,961 nucleotides in length. It is thought that fruit bats of the Pteropodidae family are natural Ebola virus hosts. Ebola is introduced into the human population through close contact with the blood, secretions, organs or other bodily fluids of infected animals such as chimpanzees, gorillas, fruit bats, monkeys, forest antelope and porcupines found ill or dead or in the rainforest. Ebola then spreads through human-to-human transmission via direct contact (through broken skin or mucous membranes) with the blood, secretions, organs or other bodily fluids of infected people, and with surfaces and materials (e.g. bedding, clothing) contaminated with these fluids.